Globally, 500 children are killed on the roads every day and many more are seriously injured. Armenia is one country with a very high road fatality rate – with children being especially vulnerable. Road safety education has been one of the main activities of the National Road Safety Council since its establishment. In 2005, NRSC joined with the Road Police of Armenia to develop a series road safety textbooks for kids as well as guidebooks for teachers, which were approved by the Ministry of Education and Science and have been used by the NRSC in their school training ever since. However, since 2017 the NRSC has also been piloting the EASST Road Safety Education Pack in schools across Yerevan – reaching over 2000 students. The Pack is a flexible educational resource to introduce locally relevant road safety messages and behaviours to kids in a fun and age-appropriate way. And so far it has been taken up in every school where it has been trialed. In addition to working with schools directly, the NRSC has also been a long time advocate for introducing road safety education into the school curriculum permanently across the country. Through numerous meetings and conferences with the Ministry of Education, local authorities and even parliamentary hearings the NRSC have continuously highlighted the necessity of road safety education in changing the attitude and behaviour of road users over the long term. 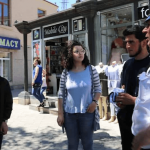 Through their position on the working group looking at Armenia’s National Road Safety Strategy have now successfully been able to include education as a key component in the National Road Safety 5-Year Action Plan (2018-2022). What’s more, in February 2018, the Minister of Education and Science in Armenia passed a decree which will see road safety education introduced into the school curriculum across the country for all children in grades 1-4. This month, the NRSC have been meeting with advisors to the Minister for education to assist with developing the methodology of these lessons using the EASST Road Safety Education Pack. Read more about how the EASST Road Safety Education Pack has been used in schools in Yerevan here.